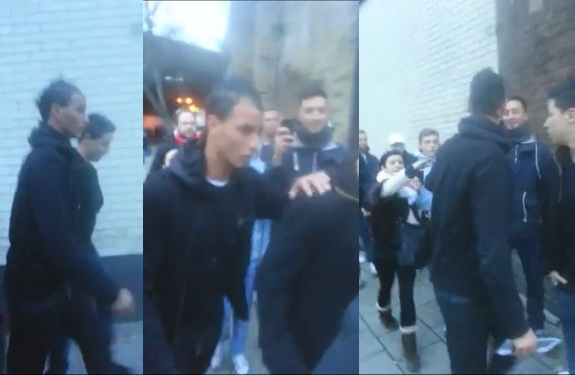 Footage of an ugly scenes between Arsenal fans, Samir Nasri and Marouane Chamakh before a match between the Gunners and Manchester City on Sunday has emerged on YouTube. Mobile phone footage showed Nasri, who did not feature in the match due to suspension, and Chamakh, who is currently on loan at West Ham from Arsenal, walking together towards the Emirates Stadium. As the pair strolls to ground, several Arsenal supporters appear to insult Nasri and Chamakh, with cuss words and aggressive gestures were hurled especially at the former. And things almost turn even nastier as one irate fan gets up close and personal. Fortunately, the man is shepherded away by Chamakh and Nasri makes it into the ground unscathed. The duo then swiftly disappeared into the belly of the stadium. Nasri became a hate-figure amongst the Arsenal faithful following his big money move to Eastlands in 2011, so you'd have to question his judgement in deciding to walk to the Emirates, where he is universally hated.